I am also enclosing this cute fan-made MV with an English song for your enjoyment. 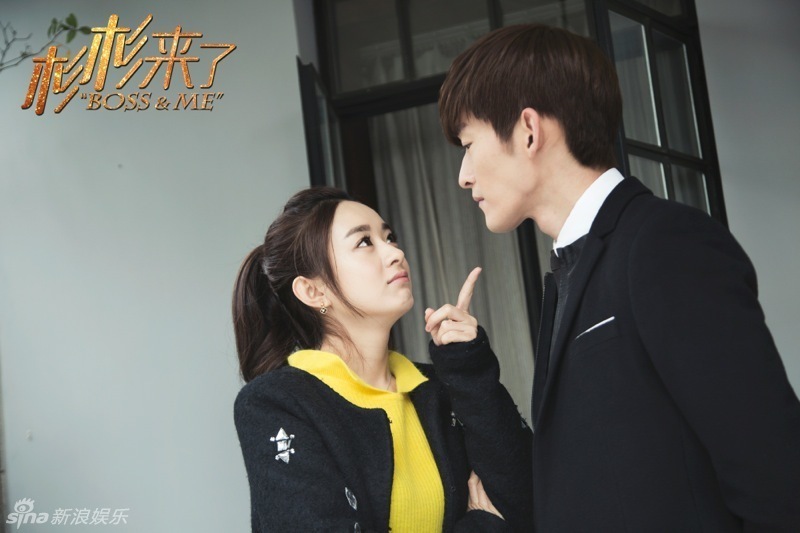 Categories: Boss & Me | Tags: Boss & Me, Zhang Han, Zhao Li Ying | Permalink. I got duped:( That silly tv channel withheld 5 mins of the drama to be shown on the following day so I thought I’ll get an episode:( But I only got the last 5 mins of Shan Shan reminiscing about her relationship then she goes to the rooftop to meet Feng Teng to watch the New Year Eve’s fireworks together. My my, what anti-climax. That is such a subdue ending? No banquet? No wedding gown like the typical idol drama? I feel kind of disappointed:( According to the rumor mill in baidu, there maybe a sequel but don’t quote me on it. I’ll tell you if that is really true as this drama is rather well-received in China so I won’t be surprised if they’ll film one. But it won’t be really following the novel so I ‘ve my reservation on it. Moreover, sequels are nearly never good or better than the original so maybe better to leave us with the best memories. Categories: Boss & Me, Gu Man | Tags: Boss & Me, C-Drama, 顾漫, Gu Man, Zhang Han, Zhao Li Ying | Permalink. These 2 episodes are basically about Shan Shan trying to earn money to repay Feng Teng the money Liu Liu’s boyfriend has run away with. During the progress, she starts to grow up to take notice of Feng Teng’s weaknesses, to be more confident, assertive, smarter and more business savvy to match Feng Teng’ better. Where in the world has peanuts gone? Peanuts has been busy subbing at viki.com. Since the manager has uploaded and started subbing, I’ll try to incorporate my mini-subs in there to help them to speed up. But lidge said, it’ll probably finish right before You Are My Sunshine’ is broadcast. Well, with friend like her, who needs enemy, lol? This episode is basically about the prenuptial agreement and meeting the parents. Shan Shan gets her reassurance that Feng Teng does intend to marry her and grow old with her. He also wants to have children with her. Actually, for the book purists, you can treat this as the ending of the drama as it follows the book rather closely. The next 3 episodes deviate substantially from the novel. I’ve translated the theme song of the drama into English. It is called Promise of the Wind (Fēng Zhī Nuò Yán). In Chinese, wind is pronounced as Feng but the Feng in Feng Teng’s name does not mean wind. It is just a surname. However, the Feng in his company’s name means wind. Hence, you can say, the promise of the wind is Feng Teng’s promise to Shan Shan. Oh, the song is so sweet and appropriate. At the beginning I didn’t really like the song but I’ve since eaten back my words and like it very much now. Bongsd even has it as her ring tone, lol. I’ve also included the 3 other songs in the drama and will translate 2 of them into English later. I’ve also found a fan-made MV to share with you here if you still can’t get enough of the drama, LOL. Firstly, I want to repeat myself and write this one final time: THERE IS CURRENTLY NO ENGLISH SUBTITLES ONLINE AT ALL!!! In view that this drama is so popular, there is high possibility that viki.com will sub it eventually so go and check their website often. If you can’t wait, reading our novel translation and/or my episode reviews will help you to understand the most important parts of the drama. Episode 26 is about Shan Shan and Feng Teng’s reconciliation. Clap! Clap! What a heartfelt confession on when he started to like Shan Shan. Then, we have more of their sweet and mushy interactions, especially the love letter incident. Melanie was complaining that Shan Shan doesn’t have a true admirer in the novel and she hopes the drama will rectified that but no luck:( Also, I am enclosing the youtube link for the song, sang by the band Dish which you’ll frequently hear in the drama.